It is not much of a recipe for a ‘Holiday dining table’ :)), but, it is a really nice side dish if you are having Chinese dinner. 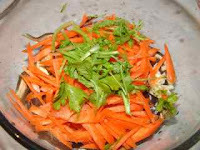 Pickled vegetables are very common side dishes in North China, especially in winter in old days when there was lack of fresh vegetables. Pickles in Northeast, however, are very different from the ones in UK. 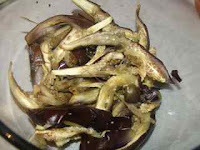 Northeast pickles are salty, rather than sour (apart from pickled Chinese leaves). The theory is that their sharp salty taste can help eating more stable food, and it is easy to store such salty pickles for a long time. My parents have forced me to reduce the amount of salt I take, they think it is too unhealthy, so Chinese pickles have also become one of my ‘must reduce things’. Nowadays, Chinese people are making pickles less and less, especially given that there is no longer a need to store vegetables in winter, as people can now find all kinds of vegetables on the markets even in the coldest, heavy snowing day of the winter. 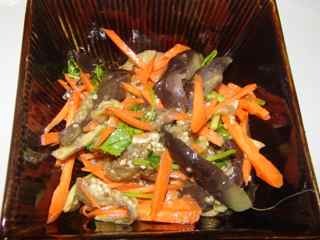 So, pickled aubergines has become one of those dishes that make me a bit nostalgic. my favorite pickles, and they will always be attached to my ‘winter memories’ — my parents used to prepare and store it in a well sealed jar, and every dinner time, my mum would ask me to take a small plate of pickled aubergines out, I would open that jar — love that fresh smell, then finish my task. I missed it so much since I came to England, so when my parents came to visit last time, the first thing I requested was aa jar of aubergine pickles. When they put it on the dinner table, in a second, I thought I was at home again — my parents brought home back to me…. It is relatively easy to make, and can be eaten straight away. If you put less salt in, it is just a plate of fresh salad; if you make it salty enough, it can be stored for a few weeks as pickles. Aubergine (the best aubergines for this dish are the small ones, I normally get a pack from Sainsbury’s, if you use the normally big size aubergine, it needs to be chopped into smaller piece before steaming). Garlic, carrot, coriander, oil, salt, or with sesame oil, light soy sauce, vinegar, sugar for salad. 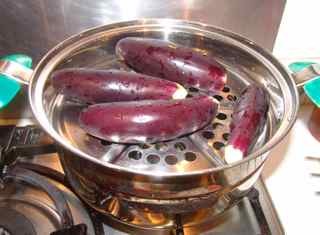 2) After steaming, raise the aubergines in cold water. 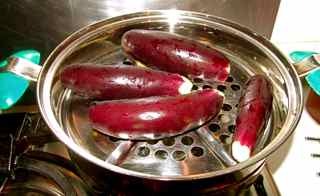 3) Tear the aubergines into smaller ‘strips’. 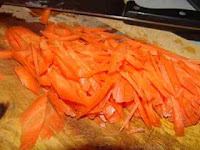 4) Chop a carrot into slim strips. 5) Wash the coriander, chop off the root (if there is any). 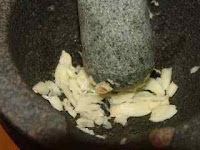 6) Mash at least 6 gloves of garlic or more. For making into pickles: add 1 and half tablespoon of salt and 1 tablespoon of oil, and place the aubergines into a jar, seal well the lid. For making it into salad to eat now: half of teaspoon of salt, I tablespoon of oil, 2 teaspoons of sesame oil, couple of drops of vinegar and light soy sauce, and a little pinch of sugar.